How Many Curtains Should Be Hung on a Double Window? Choosing draperies can be a hard choice for any homeowner. The style of drapery can change the look of an entire room. Double windows are even harder to choose curtains for because they are larger than traditional windows. However, when a few specific principles are applied it is easy to choose the right number of curtain panels to use in any room. Finding the number of curtains for double windows is easy. The number of curtains that you place on a double window is largely determined by your personal taste. Traditional rules of drapery are much less used than in the past and so it is possible to have any number of combinations for hanging curtains. The more curtains in the room, the more formal the room will look. A light, breezy curtain will add beauty and texture to a room. The kind of look and feel that you want for the room will be the largest determining factor in how many panels you use. 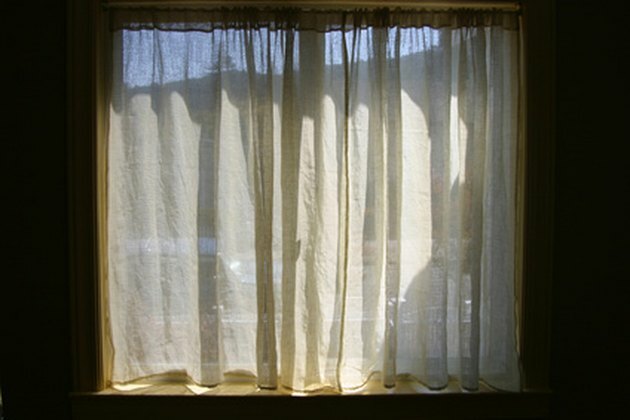 The traditional width for curtains on any sized window is two-and-a-half times the width of the window. If two panels are not large enough to cover this width then you should go with four. Measure the length and width of the window. The length of the window will help determine the length of any curtains that you get. Most curtains are placed at the window sill, just below the window and sill or grazing the floor. You can go longer, but this creates tripping hazards which can cause the curtains to fall. Curtains also get dirtier when they touch the floor. If you are going with the traditional curtain coverage then you will want to multiply the width of the window by 2.5. Go to the curtain section of a home supply store or a custom drapery store. If you go to a custom store expect to pay a lot more for your draperies. Look at the average sized panels. Compare those measurements to the measurements that you took from the double window. Decide if you want to cover the entire window or just half. Some people do three sections of curtains on double windows--one on each side and one in the middle. For this look you will need three to six panels. In most cases you will need four panels for a double window. If you want to go for the wispy look then you can get by with two panels. What Are Standard Drapery Sizes?